Frankly there is no such thing as best Multi-Tool, every tools suit every person differently. With more than 2 decades using Multi-tool experience, I have narrowed down to my needs. Swiss Army Issued SAK given to me by a Swiss friend. Last couple of years of my usage there are 2 kind of Multi-tools, one for OUTDOOR / TRAVELING and the other for EDC URBAN SURVIVAL TOOL. Previously since 1998 Leatherman Wave was my EDC Multi-Tool until 2013 I have created a super multi-tool for my need calling it Super Wave Black Tactical. You can read the post Here. This is the best Multi-Tool I ever mod however it is not lightweight. Not ideal for traveling and hiking. Most of the tools have no use for Outdoor and Traveling. Ideal usage: Bike, Cycling, Car Camping and other heavy duty work. For backpacking, hiking and traveling, it is not ideal to have the Leatherman Super Wave Black Tactical because of the weight. Below is my breakdown what I need a Multi-tool for these activities, needs to be lightweight. Few years ago I finally found what I really needed, Victorinox Farmer and Leatherman Style PS combo. Before I go further, some of you might not carry such tool, allow me reason out. Everything man-made item will breakdown even for our camping gears. I have done many outdoor emergency repair and clearly understand there are certain tools I needed to have for outdoor. The basic tools listed below is really necessary to carry out our repairs and other work function. Below are all the tools function for both Multi-Tools in total 14 functions and weighs below 130 gram. Q: Why the need of 2 set Multi-tools? 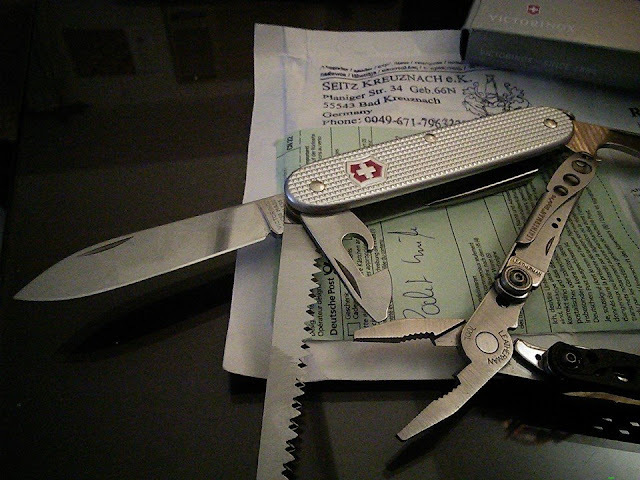 Victorinox Farmer is a camp tool while the Leatherman Style PS is used mostly for field repair. Q: Why not a Swiss Army Knife with all the tools. The pliers on the Swiss Army knife is very weak. Having 2 different Multi-Tools reduce the chance of breaking down. Leatherman Style PS is TSA approve. In my opinion the Victorinox Farmer is one of the favorite by many people. I had to order from ebay direct from Germany. If you have your favorite do share your thoughts.